For the last few years my sister has been making the most incredibly beautiful and delicious breads. She make all kinds and we are always happy to be the taste testers of her newest recipes. While she claimed baking bread was very easy, I am not a baker, so I was pretty content just to eat hers. Then last winter she sent me this "No Knead" bread recipe, saying she thought the Bee and I might enjoy making it. The recipe is very easy and actually only calls for 4 ingredients, 3 cups of flour, 1/4 teaspoons of yeast, 1 1/4 teaspoon of salt and 1 5/8 cups of water. You dump all the ingredients into a mixer, this is The Bee's job, and mix up until the dough is formed. You then cover and leave in a warm place for 12-20 hours. After the dough has rested you take it out, shape it into a ball, place on a cutting board and cover with a dishtowel covered with flour and leave to rest for another 2 hours. Then preheat the oven and a large heavy pot like a dutch oven, at 450 degrees. When the dough is ready place it in the pot, cover with lid and bake for 30 minutes, then remove lid and bake for another 15-30 minutes until the bread has a nice brown crust. The beauty of this recipe is that it is so easy to feel like a super accomplished baker. 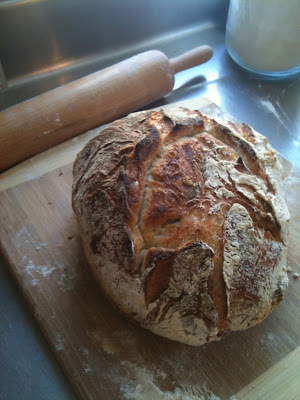 Just to show you this picture here is of the first loaf we ever made. Once you make your first loaf you can start adding and changing the recipe. Our favorite is to add a few teaspoons of honey to the water and then 1//2 cup of almond meal, which makes a hearty, slightly sweet bread. We usually polish off the bread within a day or so but if you don't you can use it to make croutons or bread pudding! A nice loaf of bread could be a great holiday gift or a fun thing to bring to a party. One warning, making bread is addictive, once you get started it is hard to stop.